Dr Aronen was a consultant at the Center for Sports Medicine at Saint Francis Memorial Hospital in San Francisco.†Deceased. Dr Garrick is director at the Center for Sports Medicine at Saint Francis Memorial Hospital. ABSTRACT: Uncomplicated lateral ankle sprains can be easily managed with materials typically found in the office (eg, gauze can be fabricated into horseshoe pads for focal compression). With early and adequate focal compression around both malleoli, use of an elastic wrap to secure the compression device and provide generalized compression, elevation of the injured ankle higher than the heart, and early pain-free range of motion exercises, soft tissue swelling can be prevented and/or eliminated and normal range of motion of both the talar and subtalar joints can be regained within 24 to 72 hours from the time of injury. Once normal ankle range of motion is achieved, the patient can begin exercises to regain normal strength of the muscles that stabilize the ankle. Although the use of a brace aids in preventing the recurrence of lateral ankle sprains, it is more important that the patient regains both normal range of motion and normal strength of the ankle before returning to regular activities. Roughly 85% of all acute ankle injuries are sprains,1 of which about 85% are uncomplicated, involving the lateral ligaments only.2 The anterior talofibular ligament is the most susceptible to injury followed by the calcaneofibular ligament. A grading system based on the level of injury to 1 or more ligaments is often used to describe lateral ankle sprains. The anterior drawer and talar tilt tests, which determine clinical instability, are also emphasized in the evaluation of ankle sprains. However, neither the grade of the injury nor the results of instability tests influence the treatment program.3 Studies have shown that the occurrence and persistence of soft tissue swelling and the associated loss of pain-free range of motion and strength in sprained ankles delay the patient’s return to full activities more than any other factor.3 Thus, the prevention or elimination of soft tissue swelling is paramount in the management of lateral ankle sprains. Regain full pain-free range of motion. Patients with uncomplicated lateral ankle sprains can be expected to respond well to a comprehensive program designed to prevent or eliminate soft tissue swelling and regain full pain-free range of motion and normal strength of the muscles that stabilize the ankle.6,7 In this second article of our 2-part series, we provide a 6-step comprehensive treatment program for uncomplicated lateral ankle sprains. In part 1,Office Evaluation and Management (CONSULTANT, June 2009), we reviewed the 8 less common injuries—5 fractures and 3 significant soft tissue injuries—that must be considered when evaluating acute ankle injuries. We also included a step-by-step guide for how best to evaluate the patient with an acute ankle injury. 1 – Prevent or Eliminate Soft Tissue Swelling Focal and generalized compression. To appreciate why focal compression around both malleoli in the evaluate the patient with an acute ankle injury. Compression devices. For years, felt horseshoe pads, secured in position with an elastic wrap, have been the gold standard for focal and generalized compression in the athletic trainer community (Figure 2). 2) However, horseshoe pads can be fabricated from other materials that are typically found in the office, such as 4 × 4 gauze pads (1 packet for each side of the ankle) and ABD (abdominal) pads, or anything that can fill in the valleys and be secured in position with an elastic wrap or bandage (eg, Tubigrip). Self-adhesive donut pads, which are sold as part of “ankle sprain kits” can also be used to either retain or re-create the valleys. Proper placement is easily achieved by ensuring that the lateral and medial malleoli are in the hole of the donut pad (see Figure 2, C). Too frequently, the importance of focal compression is overlooked as an integral part of the initial management at the time of the injury, and only elastic wrap is applied for compression. However, the use of an elastic wrap alone cannot accommodate the anatomy of the ankle, with its peaks and valleys, and instead forces the ankle into the shape of a cylinder, which allows soft tissue swelling to develop or persist in the lateral and medial valleys. Even if a patient has significant soft tissue swelling, the application of fabricated pads to re-create the lateral and medial valleys, coupled with elevation and motion exercises, can rapidly reduce the swelling. Duration of compression. With continuous focal and generalized compression (ie, when the compression device is not taken off to shower), soft tissue swelling typically resolves within 24 to 72 hours. This time frame primarily depends on how often and how well the patient elevates the leg and performs motion exercises. The patient can discontinue the use of the focal and generalized compression once the injured ankle shows no evidence of swelling, compared with the noninjured ankle. Crutches. Patients who have pain with normal (heel-to-toe) gait require crutches. These patients are instructed to walk with a heel-to-toe gait (ie, place weight on their injured ankle rather than carry it in the air) and use pain as the indicator of how much weight they place on the ankle. The crutches can be discontinued once the patient is able to walk normally without pain. 1) Be easy to fit on. 2) Fit comfortably into a shoe. 3) Provide support and protection with ambulation and yet allow the patient to perform motion exercises. 4) Continue to support and protect the ankle after the soft tissue swelling resolves. How early to start range of motion exercises. Some providers question the rationale of a lateral ankle sprain treatment program that advocates starting pain-free range of motion exercises on the day of the injury, perhaps because they are concerned that it may place unnecessary stress on the affected ligaments. However, early pain-free range of motion exercise can be justified for 2 reasons. First, ligaments limit the extreme of distraction between bones. Second, during the normal range of motion of a joint, ligaments are relatively unstressed. Thus, when performing early pain-free range of motion exercises, the stress on the affected ligaments is minimal and does not cause any harm. Types of exercises. Range of motion exercises include plantar flexion and dorsiflexion and eversion and inversion.Plantar flexion and dorsiflexion. For this exercise, the patient is instructed to repeatedly move the foot up and down, as if he or she were pushing on a gas pedal (Figure 3). This exercise can help regain or retain talar motion of the ankle. Inversion and eversion. There are 2 types of eversion and inversion exercises that are equally effective if performed properly. Both exercises require that the patient hold the heel still. With the first exercise, the patient repeatedly Figure 3 Figure 4 rotates the forefoot inward and outward, similar to the motion of a windshield wiper (Figure 4). For the second exercise, the patient, using the big toe as a pen, writes each letter of the alphabet in capital letters; the goal is to increase the size of the letters each time the exercise is performed. These exercises can help regain or retain subtalar motion. Frequency and duration of range of motion exercises. Ideally, range of motion exercises should be performed frequently throughout the day. Instruct patients to continue range of motion exercises until the talar and subtalar function of the injured ankle is equal to that of the noninjured ankle. Strengthening exercises can be started once the range of motion of the patient’s injured ankle is pain free and equal to that of the non-injured ankle. A variety of techniques that exercise the peroneal and tibialis anterior muscles have been described. Of utmost importance is that the strengthening exercise must be performed solely with motion of the talar and subtalar ankle joints. 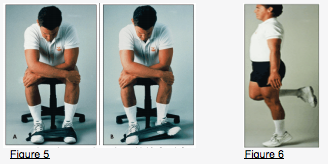 A sample strengthening exercise is shown in (Figure 5). One way to ensure that the strengthening exercise is performed solely with the talar and subtalar ankle joints is to keep the knee and leg of the injured ankle stationary. In the exercise shown, locking the knees straight forward with the hands limits all the motion to the ankle. Patients repeat this exercise until they feel a burning sensation on the outside of the leg; this represents fatigue of the exercised muscles. Patients should continue strengthening exercises throughout the day for as long as necessary until they can pass the “single leg balance test” (Figure 6). The goal is for the patient to be able to balance on the ball of the foot of the injured ankle for as long as possible. A positive test (weakness in the ankle) signals an increased risk of ankle sprain injury. The best way to stay in the game is to never get hurt again. View all of our products by clicking here. is to never get hurt in the first place. Protekt Motion’s breakthrough R3 Ankle Support System comfortably protects you from the most common injury in sports: the ankle sprain.is to never get hurt in the first place. Protekt Motion’s breakthrough R3 Ankle Support System comfortably protects you from the most common injury in sports: the ankle sprain. is to never get hurt in the first place. Protekt Motion’s breakthrough R3 Ankle Support System comfortably protects you from the most common injury in sports: the ankle sprain.